The Duke of Cambridge is preparing to interview naturalist Sir David Attenborough live on stage at the World Economic Forum. William will discuss the urgent challenges facing the next generation of environmental leaders with the veteran broadcaster in Davos, Switzerland, on Tuesday. Tomorrow at #WEF19 The Duke of Cambridge and Sir David Attenborough will discuss Sir David’s work highlighting the importance of the natural world and urgent challenges facing the next generation of environmental leaders. On Monday, Sir David was given a Crystal Award for his leadership in environmental stewardship at the WEF, and used his acceptance speech to call for a plan to tackle environmental problems. 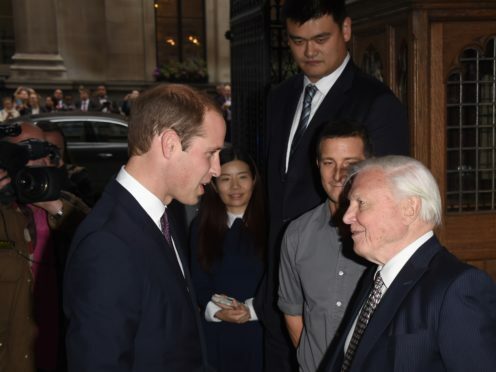 Kensington Palace said the duke would talk to Sir David about his decades of work highlighting the importance of the natural world. William has described the Blue Planet and Dynasties narrator as having “the single most important impact in my conservation thinking”. The duke has met Sir David many times, and invited him to Kensington Palace just last week ahead of their on-stage conversation in Davos. William, in a BBC tribute programme marking the world-famous broadcaster’s 90th birthday in 2016, called him a “national treasure”. William said: “There is something very calming and sort of warm about his programmes. The duke, who is patron of the Tusk conservation charity, has himself warned that the clock is ticking towards a tipping point when our impact on the environment will be irreversible. William, who is also president of umbrella conservation group United For Wildlife, has spoken out against the ivory trade for years. He previously voiced concern that the African elephant would have disappeared from the wild by the time his daughter Princess Charlotte turns 25. Sir David teamed up with the Queen for an ITV documentary last year which looked at the Queen’s Commonwealth Canopy project. Sir David and the Queen, who were born just weeks apart, chuckled over a forlorn-looking tree in the Buckingham Palace grounds which the Queen suggested had been “sat on” at a garden party.